Feel free to grab the button and email me the answers to the following questions to join The Society! The Week in Review: Looks like someone else is qualified to be a part of THAT family. But she doesn’t have a blog. 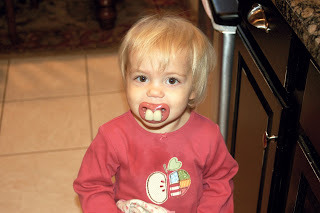 She does have a stylish pacifier though. Don’t you think? Introduction into The Society: Shannon of Simply Shannon submitted this great post as her THAT family resemblance! (It’s great in the sense that it’s perfect for this little club, but not great in the sense that I’d suggest it). The original name of my blog was “Life in the Fat Lane” and I started it to try and guilt myself into taking better care of my health…however, I recently renamed it “Simply Shannon” because it has turned into something quite different from what I originally intended it to be. Now my blog is an outlet for my creative side, which has been pent up for years and years; a form of therapy; a place to socialize with other women; and a fantastic way for me to learn new things! 2. How long have been blogging? I have only been blogging for a few months. I started officially in January, but didn’t really get into it until sometime around May or June. I define THAT family as the family that always has something going on, or a funny story to tell. I think that really just about every family is THAT family, but some hide it better than others. To truly be THAT family, you can’t be afraid to let it all hang out. 4. When did you discover you were a member of THAT family? I think my first inkling that I might be a member of THAT family was when my Dad decided to dance with my brand new boyfriend (as in my “boyfriend” of about 5 minutes) at my 12th birthday party. I’m sure that I had plenty of glimpses before that, but that was the first time that I think I was really old enough to get it. Let me just say, “Welcome to the Family” and your dad and mine have a lot in common, it appears. P.S. : That picture is priceless.